now on permanent display in the National Gallery of Victoria. To see how the Heidelberg School artist, Tom Roberts, has captured the feeling of this place, see Google’s zoomable high resolution version. That is part of the Google Cultural Institute, which is an online display of the greatest paintings in the major art galleries of the world. The painting above is best viewed at that high resolution hyperlink as it is one of a number that Google Inc. displays at its gigapixel level of resolution, which allows viewers to zoom into individual brush strokes, as the Institute’s excellent commentary explains. The painting was privately owned until the 1980s, when the National Gallery of Victoria bought it. 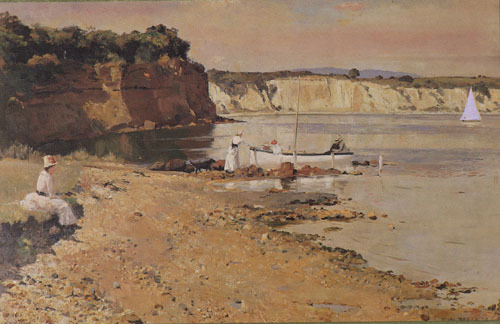 The State of Victoria owns both this masterpiece and, more importantly, the splendid landscape it depicts, but there is imminent danger of that landscape – which is of international cultural and scientific interest – being grossly marred and set on the path of ongoing despoilation by Beaumaris Motor Yacht Squadron’s proposed power boat storage against the cliff and on much of the sea. The constantly eroding, unstable white clay cliffs in the distance, with the Dandenong Ranges seen above them, were sloped back in the 1930s and vegetated, and a basalt block sea wall was built in front of them. The Victorian Government, in the 1960s, let the Beaumaris Motor Yacht Squadron fill the adjacent waters of Port Phillip Bay, and the public foreshore here with over a hectare of rubble waste – despite its long status as a Permanent Public Recreation Reserve, and to carve a road down the cliff – to form its private clubhouse and grounds. BMYS Ltd now has a 21-year lease of the filled area. The filled area is an enclave in the Beaumaris Bay Fossil Site (Identifier 18053 on the Register of the National Estate) and was partly excised from Beach Park (a Permanent Public Recreation Reserve since 1906) by a retrograde 1994 Act of Victoria’s Parliament. It is at the foot of Ray Street, BEAUMARIS.